Glasgow Defence Campaign: Stand up for your rights! Street rally against polititcal policing. Stand up for your rights! Street rally against polititcal policing. Glasgow Defence Campaign and Fight Racism! Fight Imperialism! supporters today (8 January) held a “Stand up for your rights” street rally in Glasgow city centre in defence of democratic rights and in opposition to political policing. On 30 December a supporter learned that he is facing criminal prosecution for selling the newspaper Fight Racism! Fight Imperialism! in Glasgow and is due to appear in court on 17 January 2011. We are clear that this citation is politically motivated and an open attempt to undermine our ability to organise against attacks on living standards in our communities. FRFI supporters have previously been charged by Strathclyde police for selling the newspaper and two are currently awaiting trial following their arrest on student demonstrations in the city last month. In response to the intensifying state harassment, the Glasgow Defence Campaign and Glasgow FRFI have organised an open meeting on fighting the cuts and defending democratic rights. 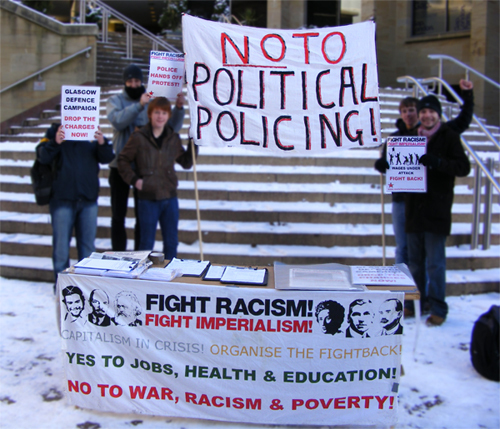 The past year in Glasgow has seen anti-fascists, Palestine solidarity campaigners, Republican activists and students all face police harassment, while in Edinburgh, three anti-cuts protestors have recently been picked up by police for participating in December´s student demos there. It is crucial that our political, organisational and legal experiences our shared for the benefit of all those active in progressive politics, and even more importantly, for those who are yet to take to the streets. All interested groups and individuals are invited to attend and speak. Self defence is no offence!